One of the seven world wonders by some account, Angkor Wat is the main tourist attraction in one of the poorest countries in the world. The day after we arrived in Siem Reap, Francien and I were treated to see the sun rise at these 12th centuries’ ruins. It was still the rainy season (every evening a thunderstorm with tropical downpours) and low tourist season so with only a few hundred other visitors we watched the biggest religious building in the world amid the dense tropical forest. Impressive because of its sheer size and rawness! Our guide lead us around the outer walls, inside the temples galleries, climbing stone-hewn stairs, past hundreds of stone carvings and up to the third level of the complex. From there we had a commanding view across the ruins and surrounding jungles. Difficult to compare with anything we have seen before, the Maya and Azteca temples in Mexico came to my mind. However, much bigger and not so elegant, the aura around this complex with the jungle threating to swallow it back again, made this a more personal experience. It made me realize how vastly different all those people and cultures around the world really were and still are, having built such a surrealistic complex at such an exotic place! 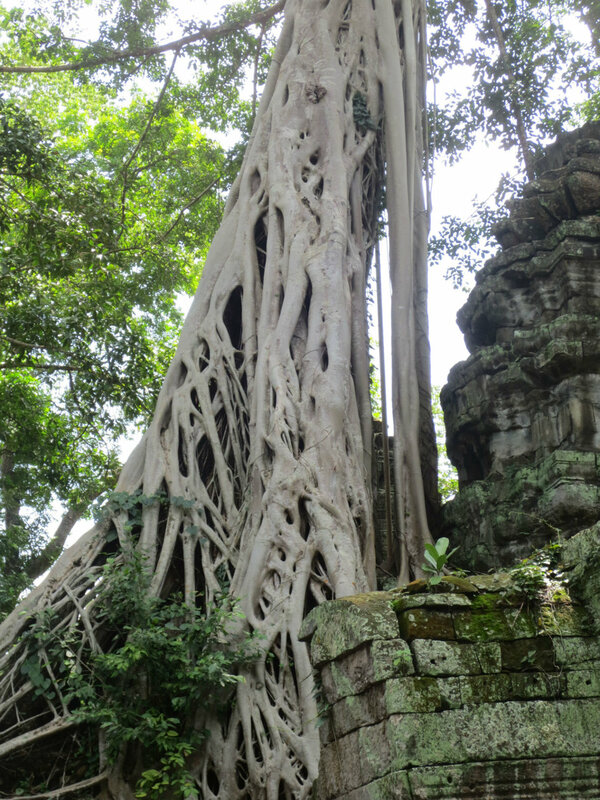 In the nearby Ta Phrom temple complex (the movie Tomb Raider was filmed here) 40 meters high fig trees grow on top of the ruins, some of the upto two meter thick roots keep the sandstone blocks of the temple together, others pushed them aside and thus destroying large sections of the religious buildings. 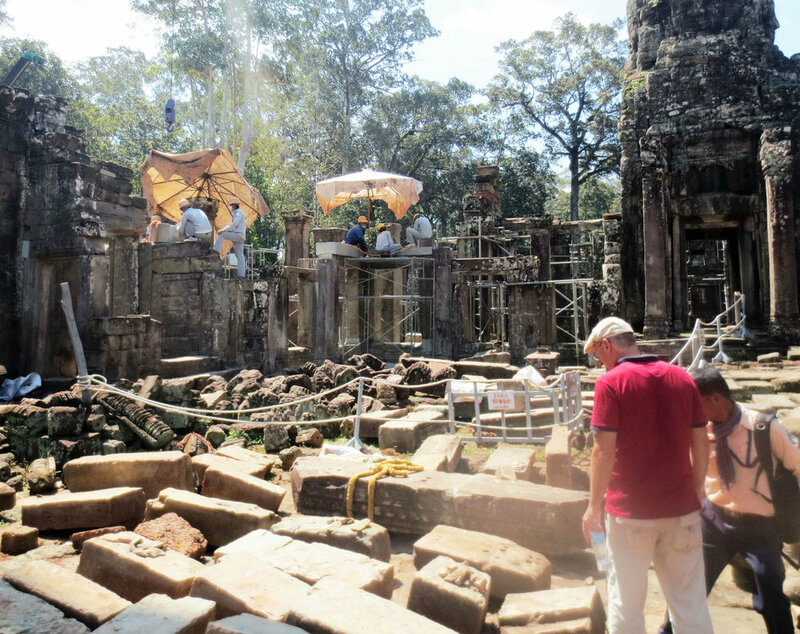 We watched a team of archaeologist (financed by Japan) restore parts of the temples. They did not wield pickaxes and shovels, but instead used cranes to move the sandstone and literate (same as what we had seen before in Malacca and Cochin) blocks around. Their task is so big that it seems they will never finish! Troops of pilfering monkeys patrolled the parking lots outside the temples searching for anything eatable. Driving in a tuk-tuk (a quirky rickshaw with a front-end motorcycle) we enjoyed the sounds and smells of everything around us with a breeze of hot and humid air blowing in our faces. 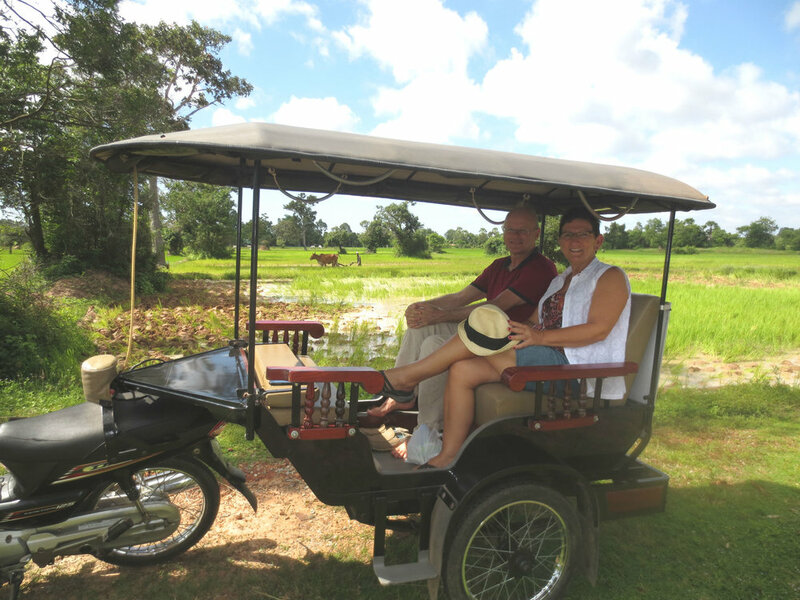 We drove on single lane tarmac roads and tree-lined red coloured rutted country roads through rice fields and tiny villages. 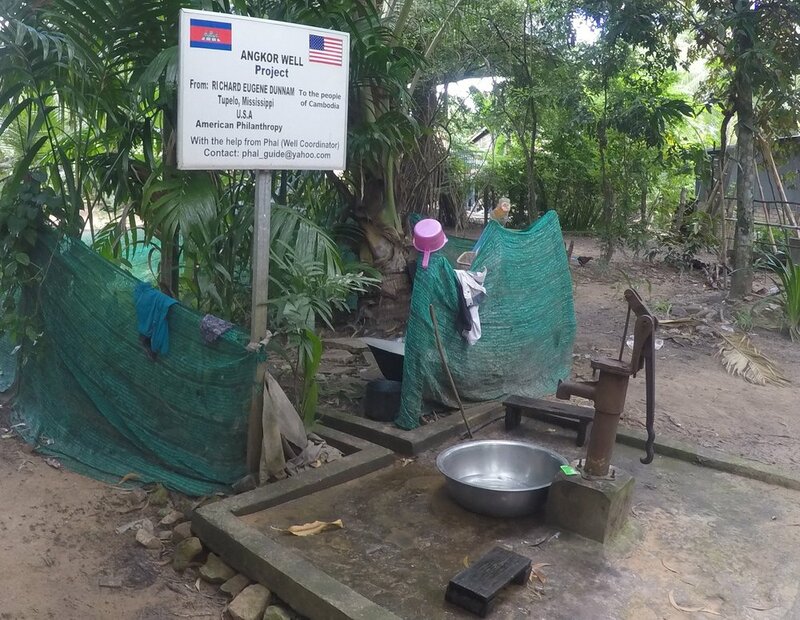 We saw a number of water wells built by NGO’s, a medical clinic which was a mere garage with a doctor sitting on a chair treating the patients for free. On the roads people spread out the rice to dry in the sun. We saw the locals (small built, amber skin and dark hair) rest in their hammocks, women heating palm oil to make palm sugar, street food stalls selling frog stomach filled with frog meat and fried spiders. 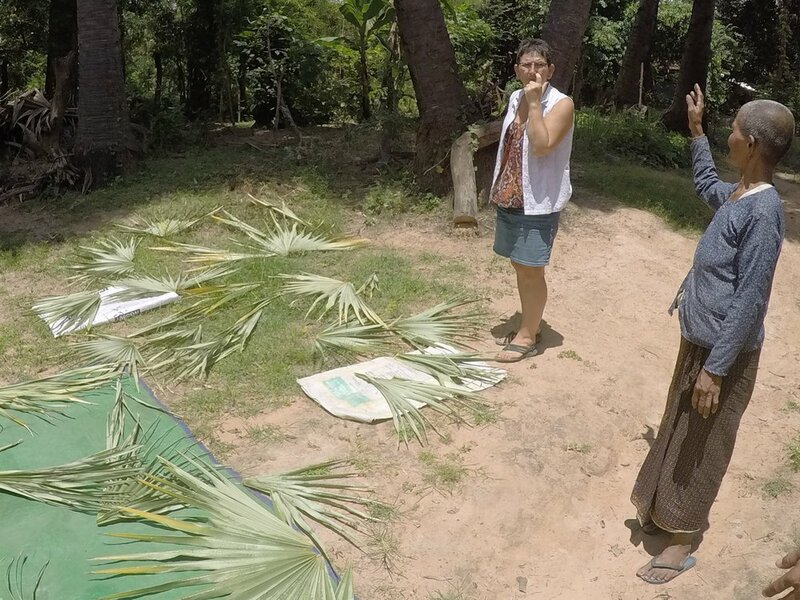 Together with Sorphea, farmer and our part-time guide, Francien and I visited a house of a 70 year old woman, living on her own small plot. She showed us all the fruits and vegetables growing on her land, too many to even remember. Catfish was swimming in her 1000 square meters rice field, water lilies grew in her little pond which she ate as a vegetable. Just enough for her own use. She lived a hardscrabbled life, but smiled! It was sobering, but the poverty here was not as brutal as what we had seen in India, Nepal or Africa. At least the people here had the space and opportunity to live of the fertile land. A visit to the landmine museum, sponsored by the UN, was a depressing display of the use of landmines during the wars in this country and the devastating impact these had on so many lives. With simple audio visual displays the work to remove millions of these crude weapons was explained. 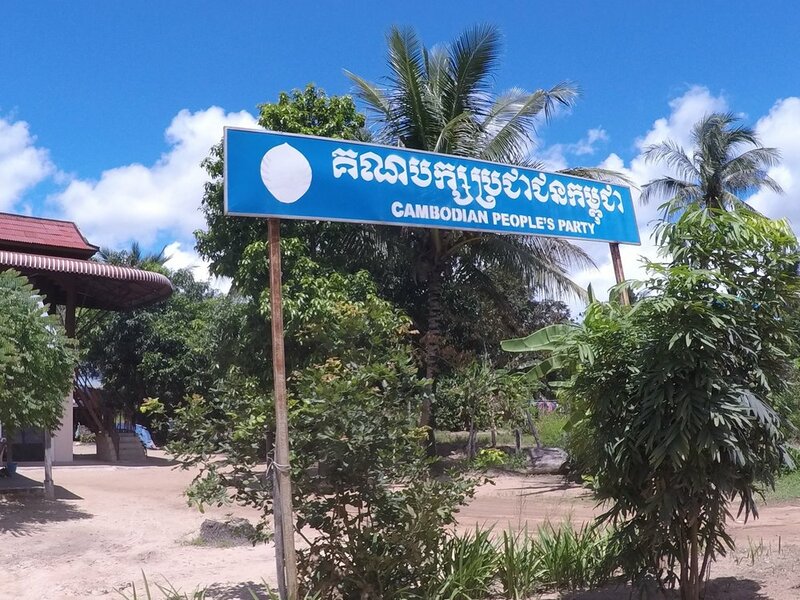 Signs of the Cambodian People's Party provoked our guide to tell us that this current ruling party is a mere agent of the Vietnamese which most Cambodians hate! In fact, further discussions with other guides revealed the age old tensions between the Cambodians with the French, Thai and Vietnamese! When Francien and I were still in high school, it was the Pol Pott Khmer Rouge regime in this country which killed 1-3 million people: the killing fields!! Kompong Phluk is located in the mangrove laced floodplains off the brown coloured Tonle Sap Lake (the biggest in SE Asia). We reached this settlement with its 3000 inhabitants on a long-tail boat. Made out of wooden planks and powered by a diesel fumes belching old truck engine, our 14 year old 'captain' controlled it with a lever stick tight with worn-off ropes to the rudder. The propeller threw a long white tail in the muddy water. 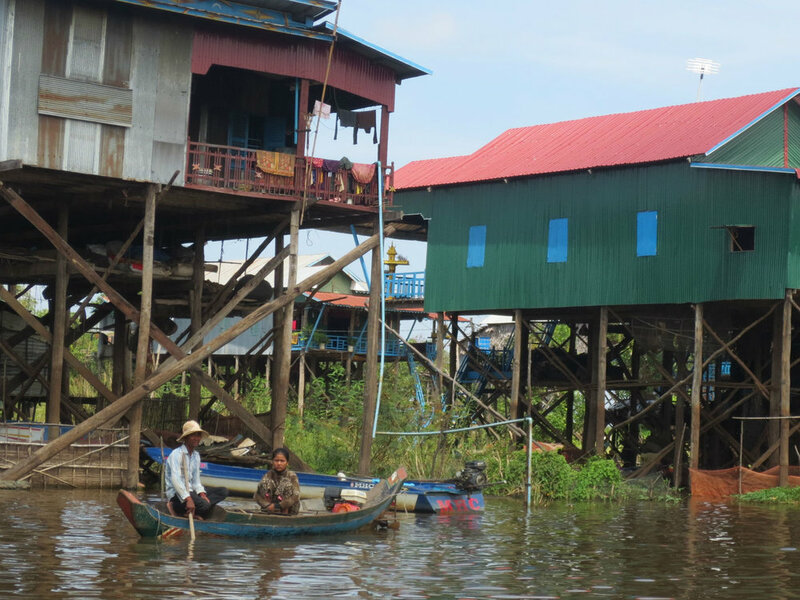 To protect against the seasonal flooding the houses were built on ten meter high stilts. 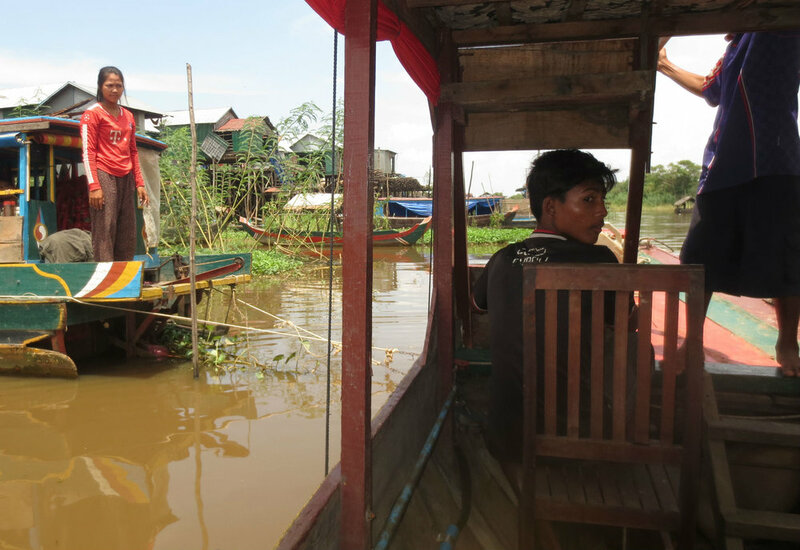 These Khmer people lived of fishing and tourism (offering boat rides, selling trinkets and running a few floating restaurants). We sat down at an open air school where a volunteer taught ten boys and girls basic English. It was as if the people here were not as friendly and we definitely felt out of place. The last night in Cambodia we went to the Siem Reap Bar Street. A blocked of area with night-markets, bargain-hunting tourists (Chinese, Japanese and Australians), touts, hawkers, US$4 / hour massages, US$ 1 beers, tuk-tuks, backpacker-hotels and bars with live western music. The ATM’s only pay in US dollars. Francien and I sat in a street bar talking with a group of six European and American men and women in their thirties looking for a stress free life with a warm climate. They seemed to have found that, earning a simple living playing music, working in a bar and teaching English at the local schools. The next morning our way back to the airport we saw a modern apartment complex being built. Would this be a place for us to (temporary) retire? No: too rural and too isolated from the rest of the world. 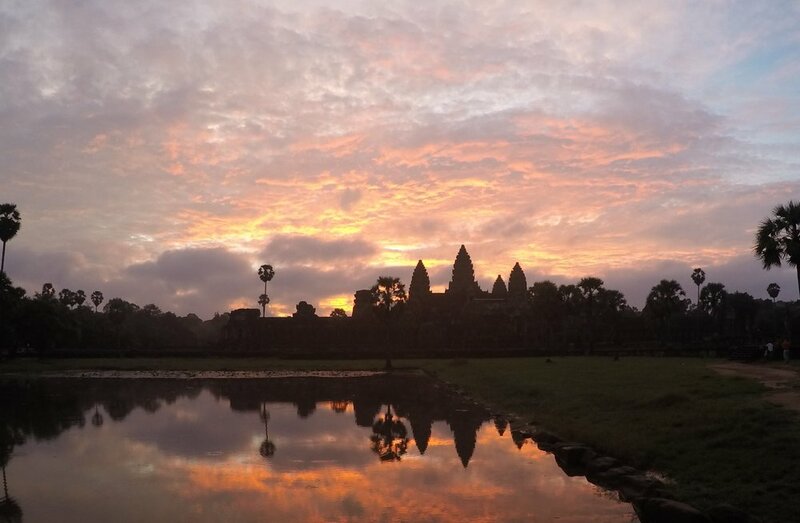 We ticked off Angkor Wat from our bucket list!